When you are trying to buy the market's best stocks, it's worth checking up on your companies' free cash flow once a quarter or so, to see whether it bears any relationship to the net income in the headlines. That's what we do with this series. Today, we're checking in on Northeast Utilities (NYS: NU) , whose recent revenue and earnings are plotted below. 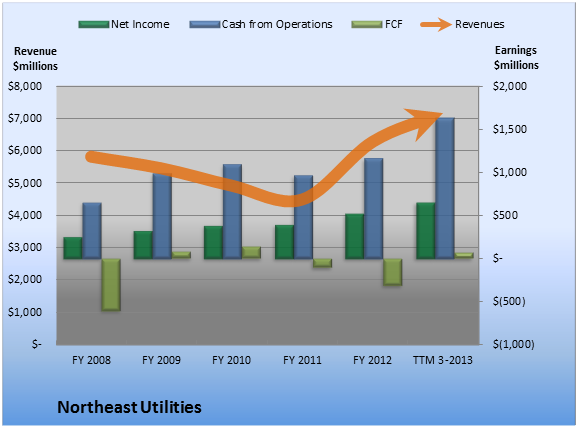 Over the past 12 months, Northeast Utilities generated $68.6 million cash while it booked net income of $654.8 million. That means it turned 1.0% of its revenue into FCF. That doesn't sound so great. FCF is less than net income. Ideally, we'd like to see the opposite. 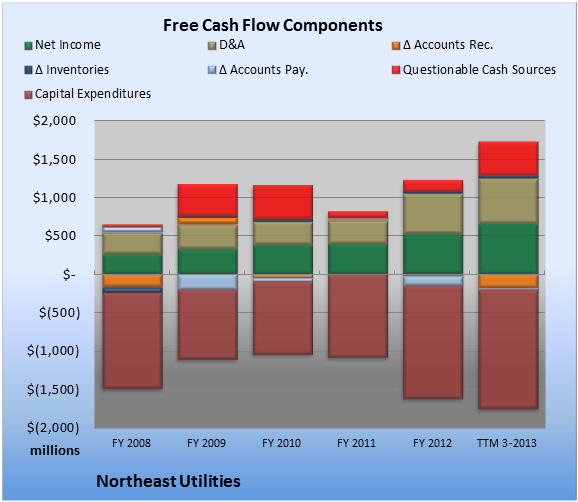 So how does the cash flow at Northeast Utilities look? Take a peek at the chart below, which flags questionable cash flow sources with a red bar. With 27.2% of operating cash flow coming from questionable sources, Northeast Utilities investors should take a closer look at the underlying numbers. Within the questionable cash flow figure plotted in the TTM period above, other operating activities (which can include deferred income taxes, pension charges, and other one-off items) provided the biggest boost, at 25.0% of cash flow from operations. Overall, the biggest drag on FCF came from capital expenditures, which consumed 95.8% of cash from operations. Northeast Utilities investors may also want to keep an eye on accounts receivable, because the TTM change is 2.6 times greater than the average swing over the past 5 fiscal years. Looking for an alternative to Northeast Utilities? By investing in this multibillion-dollar energy company, you can get in before its stock rebounds, when natural gas prices eventually do turn upward. And until natural gas prices do rebound (which a top Motley Fool analyst expects will happen by 2014), you can cash in on its stable 5.7% dividend. Click here for instant access to this free report. The article Don't Get Too Worked Up Over Northeast Utilities's Earnings originally appeared on Fool.com.